A temporary block seawall was removed from Agate Street Beach this week and will be reinstalled only as the project requires protection. Photo courtesy of James Pribram. 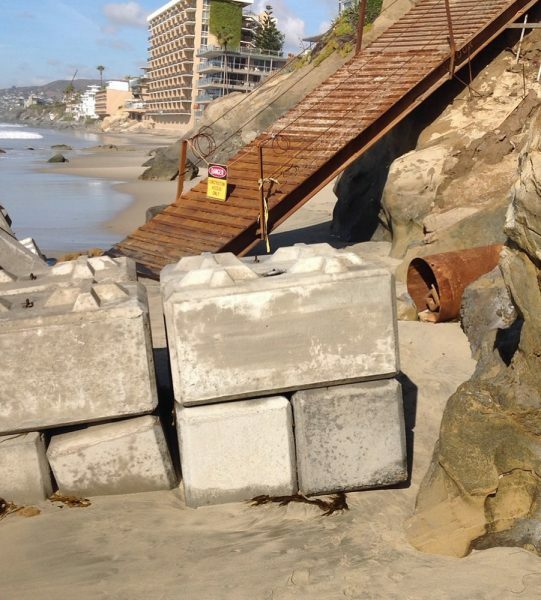 Contractors temporarily removed 37 oversize concrete blocks from the sands of Agate Street beach this week and will bring in more powerful equipment to speed up drilling on the city stairway improvements, the public works director said Wednesday, Jan. 24. The modifications in building the beach access project come in the wake of complaints by James Pribram, founder of the Laguna Beach-based Eco Warrior Foundation, which aims to keep oceans free of pollution. He criticized the temporary seawall, installed to provide wave protection for a construction ramp, as a hazard and an eyesore and questioned the reason for the project’s construction delays. His parents’ home overlooks the Agate break. Agate Street Beach, like nearly all of Laguna’s coastline, lies within a state marine reserve, a designation that prohibits damage or take of all marine resources, geologic, living or cultural, according to the state Department of Fish and Wildlife regulations. After raising concerns with both city staff and coastal regulators, Pribram met with public works staff last week and worked out an agreement that satisfied his concerns. “Both sides worked diligently, professionally and in the end, it was because all parties were willing to compromise,” said Pribram, who predicted the agreed to tweaks in the Agate stairway construction will speed its completion. Last August, the City Council approved a $1.8 million contract to renovate beach access stairways at Agate and Thalia Streets. A year earlier, a $1.4 million contract funded new stairways, landscaping, lighting and overlooks at beach access points at Mountain and Oak streets. Dupuis outlined the changes she agreed to with Pribram. They include removal of the blocks until they are immediately needed when the bottom portion of the stairs is constructed. To speed up drilling, a larger rig was delivered to the job site, which will be removed daily, she said.